Poodle Characteristics: The spirited and loyal Poodle is a breed of medium sized dog, classified as a member of the Non Sporting Dog Group (AKC:1887). The super intelligent Poodle is ranked Number 2 in the Smartest Dog List. The Poodle, is characterized by its elegant, proud appearance with a distinctive harsh, curly, non-shedding coat, often characterized by a distinct type of clip. Other characteristics include dark, medium sized, oval shaped eyes; long, wide ears and a straight, high set tail. The Poodle has a chipper, friendly expression and an effortless, springy gait. The temperament of the Poodle can be described as Faithful, Active, Alert. The coat type of the Poodle is described as harsh, curly or corded coat in assorted colors. Due to its characteristics and qualities, the Poodle demonstrated the desired traits of a Watch dog and Gun Dog and is known by its nick name the "Caniche". The origin of the Poodle dog breed was in Germany where it was developed in the 1500's. Poodle Breed Group and Dog Type - Non Sporting Dog Group (AKC:1887): The Poodle is one of the many breeds of dogs that belong to the Non Sporting Dog Group (AKC:1887). Poodle History and Origin: The country of origin of the Poodle breed was in Germany during the 1500's. An ancient French water dog, called the Barbet, is believed to be the ancestor of the Poodle, which was initially bred as a water dog, specifically a duck retriever. The custom of cutting the hair of Poodles originated during this time. The haircuts were designed to retain the hair on the head and chest to keep the dog warm whilst leaving the rest of the body free of hair to prevent the Poodle from becoming water logged (the Portuguese Water Dog was cut in a similar fashion). One of the earliest descriptions of the Poodle was in the book "House Dogs and Sporting Dogs", published in 1861 by the Englishman John Meyrick, who made the following, surprising observation about the Poodle of this era "The Poodle has never been a great favorite in this country [England], in spite of his extraordinary intelligence and docility; the great objection to him being his fantastic appearance when his body is shaved, and his clumsy look when the hair is left on". Dislike of the 'foppish' appearance of the Poodle disappeared and the popularity of the super intelligent Poodle grew. The dog was eager to please and easily trained Its desire to entertain, combined with its many attributes, drew the attention of many showmen and Poodles were featured as performers in many stage acts, often dressed in whimsical costumes and taking part in elaborate sketches. The poodle also featured as circus performers displaying their athleticism and extraordinary balance, standing on his head, riding on the backs of horses and walking on a tight rope. The Poodle was officially recognized by the American Kennel Club (AKC) in 1887. The Poodle - One of World's Smartest Dogs: The Poodle is ranked by experts as number 2 in the smartest dog list. The classy and energetic Poodle has earned his reputation for being one of the most intelligent breeds in the world for its intelligence in relation to problem solving skills and word comprehension. Poodle Modern History: The modern history of the Poodle moved on and its intelligence and other qualities such as its convenient low shedding coat attracted the attention of dog breeders during the 1990's. Dog breeders have used the super intelligence and low shedding qualities of the Poodle and established breeding programs with various other breeds to develop the so called "Designer Dogs" such as the Cavapoo, the Cockapoo, the Havapoo, the Doxiepoo, the Pomapoo and the ever popular Goldendoodle and Labradoodle. Poodle Height: The Poodle breed is classified as a medium sized dog. The height to the shoulder of a male dog is 15+ inches (38 cm). The height to the shoulder of a female dog is slightly less. Poodle Weight: The weight of the male in this medium sized dog is 45-70 pounds (20-32 kg). The weight of the smaller female dog is slightly less than the male. Poodle Coat Type - LOW shedding coat: The coat type is described as harsh, curly or corded coat. Many Toy Poodles have a Melanistic Mask (a dark coloration of the skin or hair typically on the muzzle and face of the dog) because of a high concentration of melanin. Poodle Coat Colors: The colors of this dog breed consist of assorted colors consisting of Black, White, Sable, Blue, Cream, Brown, Red, Grey, Apricot and Silver. N.B. The term "Red" refers to reddish shades of orange, brown, and tan colors. The word 'Blue' is used to describe a cool-toned, metallic gray color. "Red" refers to reddish shades of orange, brown, and tan colors. The word 'Blue' is used to describe a cool-toned, metallic gray color. In Poodles "blue" refers to coloration that is black at birth and progressively turns 'blue / gray as the dog gets older. Poodle Grooming - HIGH Grooming Needs: The coat of this dog grows continuously, like human hair growth. The dog grooming needs of the Poodle are categorized as high in order to maintain a healthy coat and reduce the risk of skin infections. The high grooming needs of the Poodle is considered to be high-maintenance and requires almost daily brushing and combing. Dog Grooming Requirements should include bathing the dog on a monthly basis and making regular inspections of the nails, teeth, eyes and ears. Poodle Litter Size: The litter size of this dog breed ranges from 2-5 puppies. Poodle puppies for sale can be obtained reputable breeders and from rescue centers. The cost of Poodle puppies varies depending on location, pedigree history and the dog breeder. Poodle Temperament and personality: The temperament and personality of this popular dog breed is described as Spirited, Faithful, Active, Alert and Loyal . Poodle Exercise Requirements: The exercise requirements of this breed of dog is dependent on its size, the bigger the dog the more exercise required for this lively dog. The small or Toy Poodle requires regular daily exercise consisting of approximately 30 minutes every day. Poodle Diet: A fully grown Poodle should be fed twice a day. A diet consisting of a premium dog food can be balanced with fresh food eaten by the family. The question is What Can Dogs Eat?. Check out our comprehensive list of what dogs can and what dogs cannot eat. Poodle Health Problems: Potential health problems of the Poodle breed include Eye Problems, Hip Dysplasia, Gastric torsion . Resolving health problems can prove to be expensive and it is always wise to obtain pet insurance or dog health insurance when buying a dog. Is the Poodle dog breed said to be Hypoallergenic? Answer: Yes (Refer to Hypoallergenic Dogs). Poodle Lifespan: The life expectancy of dogs vary according to the size, breed of dog and any serious health problems. The typical lifespan of the Poodle breed is 10-13 years. Poodle Male Dog Names: Male Dog names are most often chosen to reflect favorite names of the owner or the strength, size, coloring and country of origin of the Poodle breed. To give you some inspiration regarding good male Poodle names our small selection might be of help with naming boy dogs. Our top male dog names are: Fabien *** Hunter *** Beaufort *** Echo *** Francois *** Dash *** Gaspard *** Comet *** Lucien *** Jazz *** Marceau *** Kenzi. 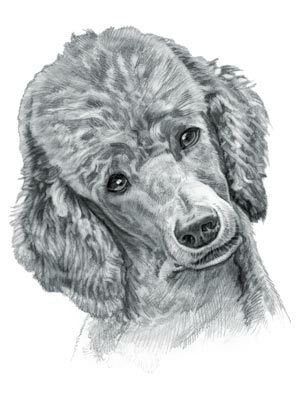 Poodle Female Dog Names: Female Dog names tend to be softer, prettier and reflect the temperament of the girl dog. Our top choice of good female Poodle names are Cherine *** Josie *** Renee *** Daisy *** Richelle *** Suzette *** Lacie *** Joelle *** Lisette *** Violetta *** Kyra.